Rediff.com » Movies » Review: Manjhi The Mountain Man is watchable for Nawaz. And Nawaz alone. Review: Manjhi The Mountain Man is watchable for Nawaz. And Nawaz alone. Manjhi The Mountain Man carries much promise but it is flimsily executed, feels Sukanya Verma. There’s a wondrous quality to grand gestures, hyperboles holding true and against-all-odds triumph. With so much to be disappointed about and so little inspiration, any shred of truth in extraordinary achievements and impressive individuals infuses hope. Such magnificent reality carries much promise on celluloid. At least, director Ketan Mehta seems convinced of its potential considering his past few films revolved around real life figures like Sardar Vallabhai Patel (Sardar), Mangal Pandey (The Rising) and Raja Ravi Varma (Rang Rasiya). What he doesn’t realise is that his enthusiasm for trimmings and affectations, even when the content is sufficiently dramatic on its own, distracts and disengages. 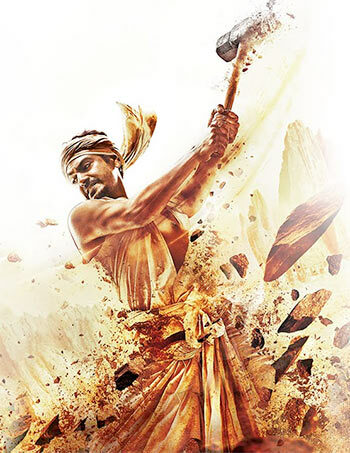 Mehta cannot resist making the same mistakes in his latest biopic Manjhi: The Mountain, a middling effort chronicling the incredible struggle of Dashrath Manjhi (brought to life by a spellbinding Nawazuddin Siddiqui). The premise is good. Mighty good. A man of no resources, hailing from Gehlore village in Bihar, resolves to cut through a tall mountain single-handedly for the purpose of creating a path using a modest hammer and chisel. Events leading to this over two-decades long commitment and how it all comes about are recounted in Manjhi, which spans over five decades. The film travels to and fro in time -- even as our titular hero toils in a gravelly, severe landscape -- through episodes marked by a shifting socio-political climate. Mehta grabs the opportunity to stuff in every conceivable scenario -- be it the prevalence of child marriage and bonded labour, subjugation of farmers and their wives, rampant casteism carried out by the vile village landlords (Tigmanshu Dhulia, Pankaj Tripathi), Naxilism, the era of Indira Gandhi-declared (Deepa Sahi intentionally/unintentionally parodying the former Indian Prime Minister) emergency or a nasty drought forcing villagers to abandon town. There’s obvious ambition at play here but the random and superficial nature of these incidents never quite explains its influence on Manjhi’s mind, method or madness. Plus, some of it is just so flimsily executed. The sequence with the Naxalites (led by Prashant Narayanan) starts and ends on a note so abrupt, it’s plain comical. A corpse floating in a village pond surrounded by strategically arranged lotuses to create postcard morbidity, how stagy is that? Moreover, muahahaha-ing villains, better suited for a 1980s potboiler, disrupt the enormous believability its leading man is striving for, in his dynamic delivery of a dedicated soul. He tenderly conveys his ardour for his spunky wife Phaguniya (a lovely Radhika Apte), which is crucial to the challenge he’ll eventually grab on. At the same time, how his hatred for the wretched mountain changes into care and understanding is vague. His transformation from romantic to activist isn’t fleshed out at all but the talented actor offers a spiritual know-how entirely based on his active instincts. Under keener direction, an allegory would unravel and enthral. On its own, it’s just a possibility unexplored. Still Manjhi is watchable purely because of this actor’s grasp of a willful, persevering personality recognised by his passion not poverty. It’s a distinction Nawaz duly delivers, if not the film. Just ask Anushka: It's not easy being an actor!